Westbank offers details including rental units, boutique retail, public space, and community art. Proposed additions. Photo by Westbank. Aerial view of proposed development. Photo by Westbank. Bathurst Street looking west. Photo by Westbank. Bloor Street looking south. Photo by Westbank. Mirvish Village ground-level plan. Photo by Westbank. Lennox Street looking north. Photo by Westbank. Looking northeast on Lennox Street. Photo by Westbank. Public market plan. Photo by Westbank. Pedestrian-friendly Markham Street looking east. Photo by Westbank. Proposed residential units and breakdown of floor plans. Photo by Westbank. Last night, the future of Honest Ed’s became a little clearer. At a community meeting, Westbank Properties—the developer that bought the property back in 2013—revealed its initial plans for the southwest corner of Bloor and Bathurst. The plan falls in line with projections made back in September. 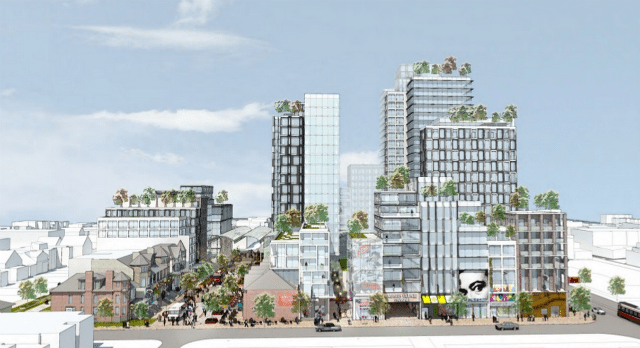 The proposal includes a thousand new rental units—low-, mid- and high-rise—along with daycare facilities, public art, a pedestrian-friendly Markham Street, micro-retail, and a sizable public market. The public market will serve as the epicentre to the 41 buildings that are proposed to occupy Mirvish Village. The project’s lead architects, Gregory Henriquez and Janet Rosenberg, stressed heritage retention as the development’s focal point. To that end, they said, 14 Markham Street houses will remain on the property. The plan also includes a diverse range of building types, sizes, and facades—the aim being a well-worn look. The architects hope that, by diversifying the planned new buildings, the area will look as though it was built up over time, from the old Markham Street houses to the proposed 29-storey tower. Henriquez also noted future plans for Markham Street: closing it to vehicular traffic, at least on weekends and for events. Mock-ups of a pedestrian-friendly Markham Street included outdoor patios, green space for sitting and local gardens, tree canopies, and public art. There was mention of a potential for collaboration with Hot Docs and other local festivals, the idea being that Markham could serve as both a venue and a community hub. The above-mentioned outdoor market could also spill out onto the street’s north end. The meeting was standing-room only, an indication of the public’s vested interest in Honest Ed’s development. According to Councillor Joe Cressy (Ward 20, Trinity-Spadina), “What happens on this corner will define this neighbourhood for the next 50 years.” With that in mind, Westbank and its partners handed out comment cards at last night’s meeting and, asked when the final proposal will be submitted, Henriquez said sometime in spring, but not before they address any concerns raised by the public.